Stony Point is a triangle-shaped town in Rockland County, New York, United States. It is part of the New York City Metropolitan Area. The town is located north of the town of Haverstraw, east and south of Orange County, New York, and west of the Hudson River and Westchester County. Gilmor Sloane House – 17 Crickettown Rd. 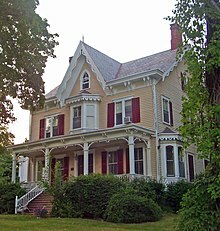 An 1856 Victorian mansion with no televisions or telephones. An 1888 Barn Playhouse (Penguin Repertory) on grounds. Harriman State Park – A large state park partly in the western part of the town. Iona Island and Marsh – Between Jones Point and Bear Mountain. It was previously called "Weyants Island".